Thanks for the kind words and the suggestions! 1) I'll add it to my TODO list. No promises or an ETA at the moment, but I'll look into it. 2) I experimented with a simple editor in the past (https://twitter.com/jdryg/status/1006576882626777088) but I haven't managed to properly implement it yet. It's definitely one of the things I'll do at some point, but again, no ETA. Hello, the game runs pretty smoothly on my computer (linux gentoo x64) except for a strange issue - it takes a long time to start. About 3 to 5 minutes, which made me think it wouldn't boot up the first time, but after some patient waiting it worked. Then whenever I finish a level (ie. the game saves) I have to wait for about 30 seconds while the game is unresponsive. My initial hunch is that it's spinning a lot on disk IO. I don't have an SSD, but this is pretty excessive. Apart from that I'm really enjoying the game, and I'm sure it will be even better with time. One suggestion: I'd like to have the output of a gate light up if it's gonna output high, this way I can know its result without connecting a dummy gate / output to it. Based on your description, the only thing I can think of is network access. When the game starts and after completing each level, a request is send to the server which keeps track of the results. Unfortunately, I haven't managed to make this request asynchronously on linux, that's why it might take a long time. But 3 to 5 mins is excessive. The most I've observed is about 30 secs during development when connecting to a local server which isn't running (so all requests timeout). I'll try to fix that in the next update. Sorry for the inconvenience. Waiting that long to play for a couple of minutes must be really frustrating. I just finish all the levels, you should add more levels cuz there is nothing on memory etc. Did u try shenzen io ? It's in my TODO list to add more levels. In fact previous versions (e.g. 0.15) had more and different kind of levels (sequential circuits and streams) but I had to remove them from this version because they didn't seem to function correctly with the new logic simulator. Now that I've added the HDL I will certainly add more levels with only HDL components to make the player familiar with it. Newest release is broken on Linux. It exits immediately with 255 exit code. Tested on Ubuntu 18.04 and on Void Linux. Sorry about that. Tested it only on Ubuntu 18.04 on a VirtualBox VM (with software rendering). Does it create a log file? If it does, can you post its contents? Check your Documents folder. There should be a DLS subfolder there. Rename it to something else (just in case) and run the executable again. If there's no DLS folder in your Documents or no dls.log in there, it's a bit hard for me to debug it remotely. Can you post your PC configuration? I don't have dls.log anywhere in my home directory (find . -type f -iname '*dls.log*' -> no output). I tried to run game with GDB but I doubt log will be useful without debug binary. The developper seems to have lost interest updating it, too bad, it was promising. Thank you for your interest and sorry for the long delay on the update. I've changed so many things since v0.15 and I wanted to test them all out before releasing an update. Unfortunately, the more I postpone it the more stuff I have to change and fix and test. Yes the app is still under (slow) development. Can you please tell me on which platform you are getting the crashes and under what circumstances? The only known crashing bug on the current release (0.15) happens when the app exits. It's a problem with the order things are destroyed when shutting down. But it shouldn't affect either your saved schematics or savegames. If you are facing any other issue, please describe it so I can track it down and fix it on the next release (if it's not already fixed). If you are on Windows you can try submitting a crash report so I can take a look at the crash dump and figure out the problem faster. Ok, i think it is the exit crash that I am experiencing. There are two issues though, first is that the tutorial takes a minute or two to load and when i click on the individual lessons it shows loading statistics and no statistics are actually shown, is this normal? Although development is slow but i believe it's a promising app. Hope to see some updates soon. Thanks for the kind words. Development has been really slow the past year but I'm still working on it. I've changed a lot of things internally (i.e. UI) and I still haven't finished the transition to the new code, so it'll take some more time until the next version. The only issue I'm aware of is that on Windows the game crashes when quitting, but this shouldn't affect any of your savegames or sandbox schematics (crash happens later in the code). Have you found any other bug? If yes, I'll be glad to hear it and see if it's already fixed or not for the next version. Sorry for the delay on the update. Cool game, keep up great work! i don't understand why the \bwe pin in the SRAM component is 2 bits wide when the Din pin is more than 8 bits wide. I just took a look at the manual and you are right, it's not clear enough. SRAMs in DLS are word-addressable memories. If your word size is larger than 8 bits (Din width greater than 8) you have more than 1 byte per word. \bwe is an active low signal controlling which bytes of the addressed word will be written (bwe = byte write enable). This way, on the next rising edge of clk, only the 2nd byte of the 3rd word will be overwritten, leaving the 1st byte intact. Hope it clears things up a bit. If not, I'll try a more concrete example. i think i understand it better but the concrete example would be welcomed. If I understood correctly, what you expected to see was an 1-bit write enable input independent of the word width. Am I correct? You are indeed correct.That's how RAM components are designed in other softwares i use, like logisim or logiccircuit. OK. Can you perform the operation I described above in those simulators? Ie. With 16-bit words, write only 1 of the 2 word bytes on the next clock tick? Looking at Logisim help pages (http://www.cburch.com/logisim/docs/2.7/en/html/libs/mem/ram.html), if I understood correctly, you can only store whole words when ld=0. So in order to write only (e.g.) the 2nd byte of 16-bit word, you have to first read the word into a register, replace the 2nd byte's value and store the new 16-bit word into the SRAM. Which in turn means that you need at least 3 clock cycles. With separate write enable signals for each word byte, as in DLS, you can do it on a single clock cycle. is there any chance of the max bit size of a wire being 32? im trying to make a mip processor but using 2 16-bit lines instead of 32-bit is making it pretty large. At the moment all signals are 32 bits wide internally. But I need a way to distinguish UNDEFINED and ERROR values so actual signals inside the editor are limited to 16 bits. This is because UNDEFINED/ERROR have fixed 32-bit values. In order to make wires carry 32-bit values, signals should be either turned into a struct (32-bit value + flag for Valid/UNDEFINED/ERROR) or increase their size to 64 bits. Both of these ideas require a lot of internal changes to the simulator, which I'm currently considering but haven't managed to make yet. Regarding I/O pins at the top/bottom of the component. It's in my list of things to implement at some point, but it's low priority at the moment (also, I have to figure out what to do with the name of the component in this case). Currently I/O pins appear only one the sides of the component (left pins are always inputs and right pins are always outputs). Also, their order is the order you created them in the first place. This is also in my TODO list (being able to change the order of appearance) but I haven't decided what would be the easiest and most intuitive way to implement it (e.g. separate component symbol editor/popup or select I/O index from the port's context menu?). That sounds great. Thanks! Don't know when I'll find some time to implement it and how far I'll take it, but it sounds interesting and it's something I'll consider. FYI, the bug you were facing when creating a new component + package has been identified and will be fixed. Thank you again for your detailed steps to reproduce it. Apparently, I've never written the component name *before* opening the new package dialog, that's why I've missed it for so long. In the meantime, try to create your new package before giving a name to the new component. Awesome. Ya a easy to miss bug, tho the glitchiness I meant earlier is when in windowed mode. everything visual seems to be shifted up one unit so it's a little hard to make connections. might be the start menu bar messing with the dimentions it thinks it's is. Also what iststs you make like like a priority value for inputs or outputs in the right click menu to change the order? Don't know if I'll be able to fix this because both window dimensions and cursor position come from GLFW. I'll search for a fix, but I cannot promise anything yet. Regarding I/O priority/order. That's one of my thoughts. Don't know if I manage to implement it for the upcoming version (0.13) but it'll be done at some point. Ok I'll do the same with resolutions. Thanks. I'll post any other bugs I find. The bug related to the new component/package dialogs has been fixed in the latest version (0.13.0) I just uploaded. Unfortunately, I didn't have enough time to search for a solution to the windowed-mode issue. Hope to fix it some time soon. Could you put on github schematics for 16-BIT FLOATING POINT ADDER from blog? How do you use the ROM? I am using the Demo version. I have seen the 7bit display but it is not clear enough. A ROM is a combinational component (i.e. it has no clock input). Whenever addr changes the output is updated with the data at the specified address. If you are referring to level 2.03, you have a 4-bit input and an 7-bit output (the 7-segment display; the dp input can be hardwired to a 0 constant input port). So you need 16 7-bit numbers to cover all the input numbers. Create a 7-bit by 16 words ROM, right click on it and select Edit values. At each byte (since the "words" are 7-bit long, 1 word = 1 byte) write the value it is expected by the 7-segment display to show the correct digit for the corresponding number. E.g. if the input number is 0, the ROM address would be 0, meaning the first byte. So at the first byte you should write 3F (or 0111111b where each bit is connected to a specific segment of the display). Take a look at the truth table to figure out the correct values. or do you take the output and type that? although I do not know what to do with the h. this seemed to me the wrong way because on the right it was just either periods or random letters. No! You just write the the output values to each byte of the ROM. The first ROM byte should read 3F. The 2nd 06, the 3rd 5B, etc. Ignore the ASCII view (right part of the ROM editor). The ASCII view just shows the corresponding ASCII character for the byte value you have typed. But in this case this is irrelevant. > although I do not know what to do with the h.
The 'h' next to every output value is used for showing that the value is in hexadecimal format. It's not part of the number. I suggest you try creating some constant input ports or switches from the I/O dialog and connect them to the various inputs of the 7-segment display. Change their values and try to make the 7-segment display show the expected numbers (0, 1, 2...). Then take the bits of those inputs in turn and build 7-bit numbers. Those numbers in hexadecimal should match the expected output. A=1, B=1, C=1, D=1, E=1, F=1, G=0. So, the output of the ROM for address 0 (i.e. the number you want to show on the display), should be 011111 in binary, or 3F in hex. also have you though of different-bit inputs? I remember there was a level where you had to compare 2 4bit inputs with a 1bit input. I thought I had to split the wires to add them together. 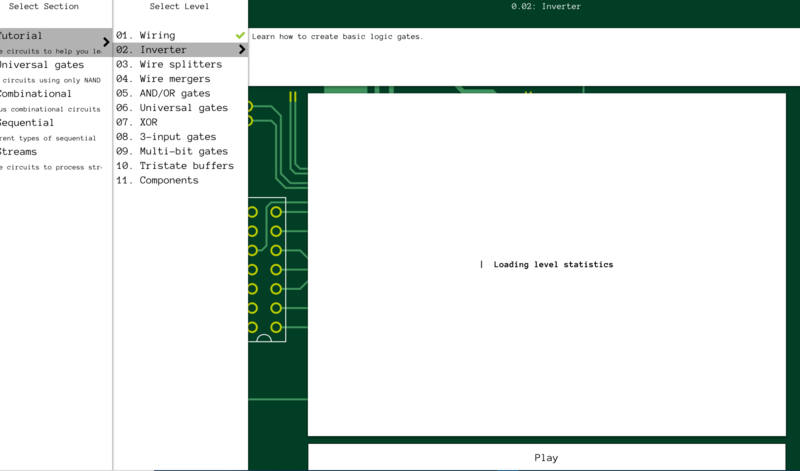 for example, an and gate has 1 imput require 4 bit and the other 1 bit, so it compares the 1 bit with the other bits. as if the 1 bit wire was 4 bits of 1's or 0's. (S)RAM component: I've been thinking about it. The only reason I haven't implemented it yet is because you can always use a scripted component to implement something similar. The problem is that there are many types of SRAMs out there (sync/async, fall-through, pipelined, burst reads/writes, etc.) and I have to study them a bit more to figure out the proper way to implement such a component. And the only reason to actually implement it is ease of use (just drop a RAM in the circuit) and the ability to inspect its contents like ROMs. Other than that, I cannot see any other benefit over scripts. I can create a simple SRAM script for you to use if you want, until I figure everything out. Wires and T-junctions: Unfortunately, I didn't understand your suggestion. You always start a new wire from an output pin. If you drop it on an existing wire, what I would expect to happen is to connect the output pin to the input the old wire is currently connected to. No T-junction can be created in this case (each input pin has only 1 source). What you suggest might have made sense if you could start a new wire from an input pin, but that's not the case currently. Am I missing something? LEDs: There is a LED matrix component in the toolbar. You can create a 1x1 matrix and connect an 1-bit wire to it. Please correct me if I didn't understand your suggestion. Regarding changing the color of a LED matrix, I'll add it to my TODO list. Wire thickness: Sounds good. Will try it and see if it'll look good too :) Will report back for feedback. In case of "LED", yes, I saw that it is possible to create 1x1 LED Matrix and this is ok (anyway maybe it would be good to have directly something like single LED component) it is useful as visual indicator. But my main idea is to have option to select color - when you building big circuits you can use different colors to indicate some states of circuit. For example flags from ALU. I know also that there is output component which shows the value but visual indicator is sometimes also very useful. As for T-junction I understand that it is some specific property because you always start from output to imput. For example creating junction is very anoying in LogicCircuit because if you want to create T-junction you need to click on wire with some keyboard button and then it splits the wire and you can connect other wire to this split point. The way which I like it is implemented in many tools like Altium Designer and LogicWorks - you can start by connecting components by any direction (you can start from output to imput but it doesnt create problems because still output is output and imput is imput, this is more editing behavior, I think). Or for example if you create mux with tri-state buffers you need to connect in some point two inputs to one output, ofcourse this works in DLS, it is just editing thing, in this other apps I could create wire from buffer to output and when I want to connect second buffer to output (with NOTed control input) I just start wire from buffer output and when I drop end of new wire to existing one it will create junction in this place. As for RAM I think that it could be just simple device, I know that there are many types of memory but as always there should be some simplifications. Maybe something like this in LogicCircuit: http://www.logiccircuit.org/memory.html in this example there is separate port for data in and data out but in LogicWorks you can select if there should be input and output or bidirectional port. PS: I created 8-bit CPU for my final thesis on my IT studies. Belowe there is partial schematic but it evolved much since this version (for example I added interrupts controller) but I was searching for app like DLS to create this new version so I think that I will soon to start building it in DLS, it would be 16-bit (I was thinking about 32-bit but I know that DLS is 16-bit max). I'm working also on FPU but I must redraw all of this in DLS because I was using LogicWorks before but it was too old and glitchy. LED colors: Do you want to have both states (on/off) configurable (e.g. on = green, off = red) or just one color with different brightness will be enough (e.g. like it's implement now, on = light green, off = dark green)? T-Junctions: Yes it's only an editing thing. To be honest, a couple of other users suggested that you should be able to start a wire from an input pin. It's already in my TODO list but I've categorized it as not important so it's a bit low on priority :) Hope it's not much of a hassle until it's "fixed". RAM: As far as I can tell, the RAM described in the page you linked is async. One Write input which works as a clock signal (whenever a rising/falling edge is detected, data is written to the RAM). Problem with implementing just this version is that if you want to implement anything more sophisticated on top of it (e.g. synchronous pipelined SRAM with burst reads/writes), you'd have to build a component and you'll loose the ability to inspect the RAM's contents (once a RAM is inside a component you don't have access to it from the master schematic). That's why I'm thinking whether it'll be good to implement extra (configurable) features for it or not. 16-bit limit: Unfortunately, the way the simulator is implemented (how signals are stored and moved around and how special values such as Undefined and Error have been implemented) doesn't allow for a larger signal width at the moment. It bugs me too and it's on my list of thins to "fix", but since it's still early in development and it's supposed to be a game at some point, 16-bits should be enough for now. In case of LED color I was thinking about something else - like it is implemented but with option to set LED color (green, red, blue, etc.). So before you place LED component you can select it color and then in circuit for e.g. it is dark red or green or whatever color you can pick and when on light red, green, etc. Something like standard LED. There is a little bug - when you place buttons in a column label from other button is overlay button and it is hard to click on a button because it will open edit label dialog, maybe label should be on the left side of button? Regarding the push buttons (and any other I/O port in general). This isn't actually a bug. It's by design. In order to avoid something like that, please arrange the buttons in reverse order. All ports are rendered in the same order they are created.So by reversing their order, you can hide their label behind the newer port. I'd like to inform you that several of your suggestions have been implemented and are available in the latest version (0.13.0). and a couple of other things. If you happen to find some time to test it out, I'll be glad to hear your feedback. Thank you very much. I will install new version and look into new features. > first: could you implement more advanced save/load dialog which would allow to select directory to/from save/load? Unfortunately, that's harder than it sounds. Implementing a proper save/load dialog using custom UI requires correct handling of Unicode paths and filenames, which in turn requires major changes to the application. This is one of those things I decided early in development and are a bit hard to change at the moment. Don't forget that even if the simulator is capable enough to handle complex circuits, my initial thought was to make some kind of game out of it. So, arbitrary save/load paths didn't fit in such scenario. Having said that, what I have in my TODO list is the ability to add slashes as separators when saving a schematic, in order to be able to group your circuits into subfolders inside the existing schematics folder. Still needs some work to be implemented properly, but it's a lot less than what's required for what you suggest (i.e. since DLS doesn't allow non-ASCII chars in its input boxes, there's no need to handle Unicode paths). That sounds nice. And it might be more accessible in case I add more build-in components in the future. I'll think about it. > And third thing: maybe text component which would allow to place text note in any place in circuit. I had that in my list, but I cannot find it anymore :) Probably removed it as not-needed. As far as I remember, what I had in mind was something like PDF comment annotations. Small symbols on the schematic grid, which you click to show/edit a comment. Is this what you have in mind? Or you want the text to be visible at all times? Maybe a "pin note" button will allow both ways to be implemented. I'll also think about it. > LogicWorks unfortunatly refuse to cooperate with my CPU. Do you mean that it cannot simulate your schematic fast enough? Do you have any numbers which you can compare with DLS once you manage to rebuild your circuit in it? E.g. how fast is the simulation in LogicWorks (i.e. circuit nsec per wall-clock sec), like in DLS? Is there such a metric in LogicWorks? I don't know what kind of circuits you've managed to build with DLS so far, so I'd suggest to not expect much from it performance-wise. The largest circuit I've managed to build was a cycle-accurate i8080 CPU but the simulation performance isn't great (~750usec/sec on my i3-2100). The double function would be good - option to pin note to always show it content or to keep only icon. Some important notes could be pinned and others which are additional could be hidden. Well, it is not speed problem at this point. It is extreme laggy and it wont work at all with around half of my CPU. I think that it would be possible to somehow compare speeds. Maybe two identical circuits, CPUs, my first LogicWorks CPU (8-bit) was computing Fibonacci series. PS: new idea - pull-up resistors. Sometimes when you use tri-state buffers you want 0 instead of "Z" (not connected state) https://en.wikipedia.org/wiki/Pull-up_resistor. Unfortunately, the dual Xeons won't make a difference in performance. Currently simulation is single threaded and only 8ms of frame time is devoted to it. Until I manage to move the simulation to a separate thread and it ends up being faster than the single threaded version, 8ms should be enough for smooth interaction with the schematic. Aren't pull-up resistors considered analog devices (i.e. they require a Vcc or Gnd pin to work)? If yes, they don't fit into the current simulator. Can you describe a situation where a tri-state buffer with a 0 instead of Z output would be required? The only reason there are tri-state buffers in DLS is to be able to support buses (which are effectively wire-OR structures). Is there another usage for them? Isn't it possible to use AND/OR gates in places where you need a tri-state buffer with 0 disconnected state? The tutorial says a bus will output the first non-undefined input, but when it has 2 defined inputs it outputs undefined. Is this a bug? Because if not I think it should be explained better. To be more specific: Originally (pre v0.10) if a bus had more than 1 non-Undefined inputs, the output returned an Error value (red wire). On v0.10 I removed all Errors from the build-in components (tri-state buffers with Undefined control pin and the bus), and I thought I should make it work like it's described in the tutorial (first non-Undefined input got forwarded to the output). But, apparently, I never did the change, so if a bus gets more than 1 non-Undefined input, its output is Undefined. I'll fix the description for the next release. Sorry for the confusion and thanks for reporting the bug! PS: Actually I think a bus should behave more like an OR gate, which ignores all Undefined inputs. It should just OR together all defined inputs and return that as the result. But I think this might break some existing circuits, that's why I'm still keeping the current behavior. If you have any thoughts on the subject, I'll be glad to hear them. Trying to solve "Decoding", and I connected A directly to a 3x2 Bus. I get U on output and not the A value. Why is that so? You are right. There seems to be a bug with the bus component. Managed to reproduce it so I will most probably be able to fix it. Will upload a new version as soon as possible! I just uploaded a new version (0.11.1) which includes this and a couple of other bug fixes. Can you do a 32bit version for windows 7? Unfortunately I don't own a Mac at the moment. Somebody else is building DLS for me on OS X, so I doubt this is possible. Sorry for that. Hope you'll be able to try it out at some point in the future. No problem, I'll run it in a Linux VM! Awesome game - just got my 8 bit CPU up and running :). Would love to be able to paste into the ROM editor, I want to write a compiler for my CPU but can't deal with writing the instructions manually! Until I figure it out, you can work around the issue by using a scripted component for your ROM as I did in the 6502 schematic for the Kernal ROM (https://github.com/jdryg/dls-schematics/tree/maste...). Either extract the component from the schematic or copy/paste the script into a new component. Then, Base64 encode your ROM and paste it into the script. It should work. You can even make your compiler generate the whole script and just paste the output into DLS. Hope that helps for now. Thanks for the feedback!